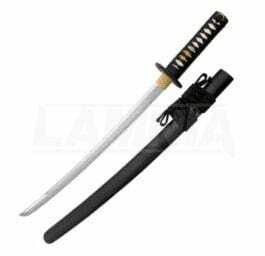 Made as a companion piece for our Practical Plus Katana (SH2073) and Tanto (SH2259), the Wakizashi features an edge-tempered high carbon forged steel blade with a prominent hamon, genuine Same (Rayskin) on the Tsuka, and a handle wrap (Tsuka-Ito) specially developed for its gripping qualities. The fittings of the Practical Plus are decorated in a Japanese Dogwood motif with dragon menuki, and the handsome Tsuba is of an iron "sunburst" design with a brass habaki. Specialus užsakymas. Pristatymo laikas 3-7 darbo d.